This post is the video companion to this video. This experiment is hands-down the most beautiful chemistry demonstration I've ever seen. 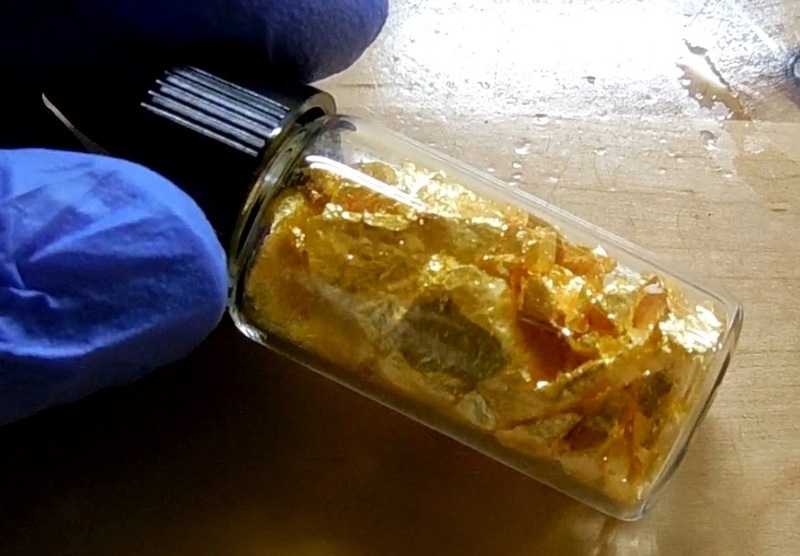 I'll be synthesizing lead(II) iodide, which has a beautiful golden yellow color. 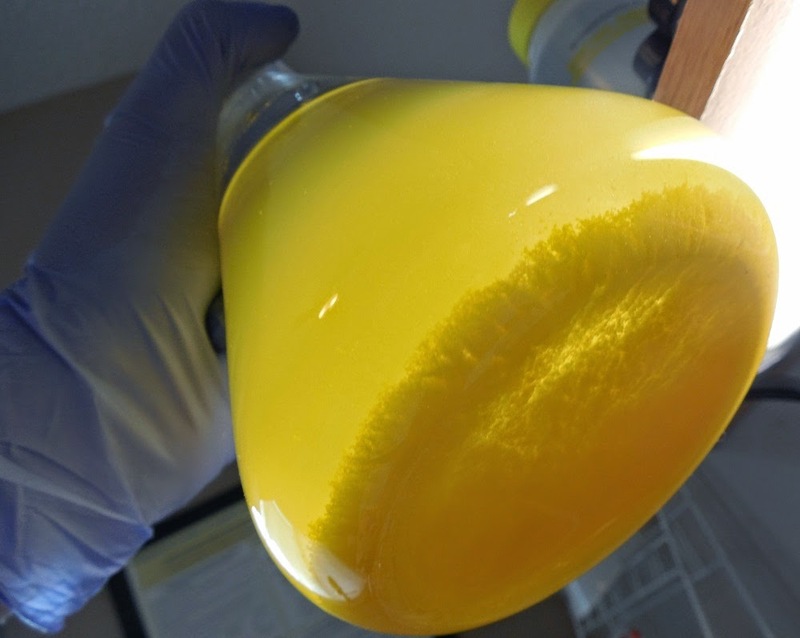 This experiment is especially striking because this bright yellow solid is produced from two water-clear solutions. Warning! Lead compounds, especially soluble lead compounds (like lead nitrate) are very toxic. These should only be handled by an experienced chemist with maximum safety precautions taken. I do the dangerous stuff so you don't have to! The first step is to dissolve both reactants in distilled water - 250mL for each solution. Stoichiometrically, equal amounts of the two reactants are needed for this reaction. For safety reasons, I used an excess of potassium iodide to ensure all of the soluble lead is reacted away. The potassium iodide is extremely soluble, and will dissolve very quickly. Lead nitrate, on the other hand, will sometimes hydrolyze and leave behind a small amount of white precipitate (likely lead oxide or hydroxide). If this happens, a few drops of nitric acid added to this flask should bring everything into solution. Now we simply add the two solutions together. I went a few drops at a time to start. 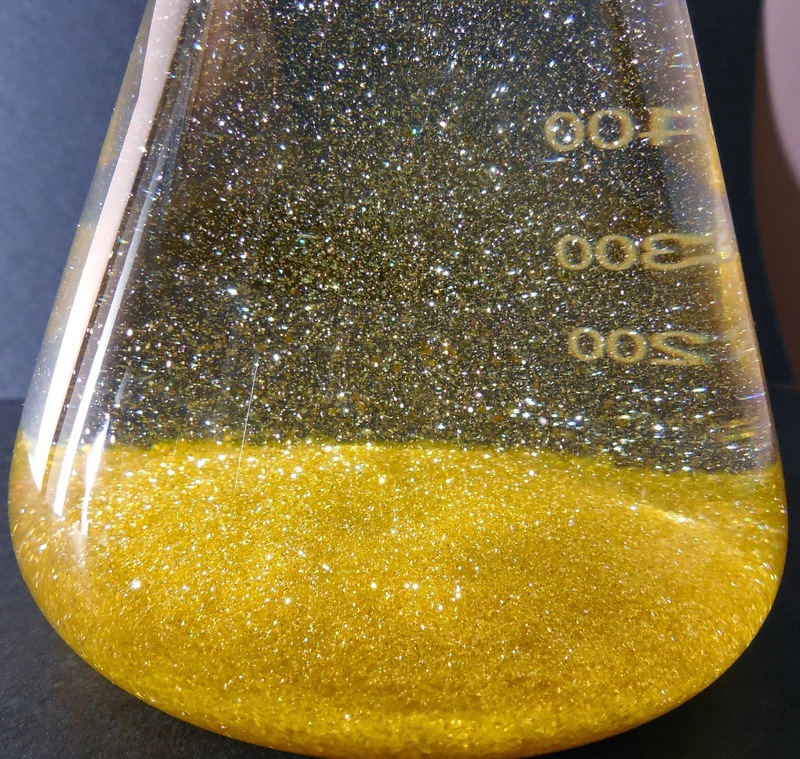 As soon as the solutions touch, bright yellow lead iodide is produced. The crystals are so small that it looks silky. Click the following pictures for much larger detailed views. Lead iodide is slightly soluble at room temperature, so after the first precipitate is formed a bit of swirling dissolves it back to a clear solution. I then added the rest of the KI solution to the lead nitrate. Pouring the KI solution into the lead nitrate was actually another safety measure - I wanted to minimize handling the lead solution as much as possible. 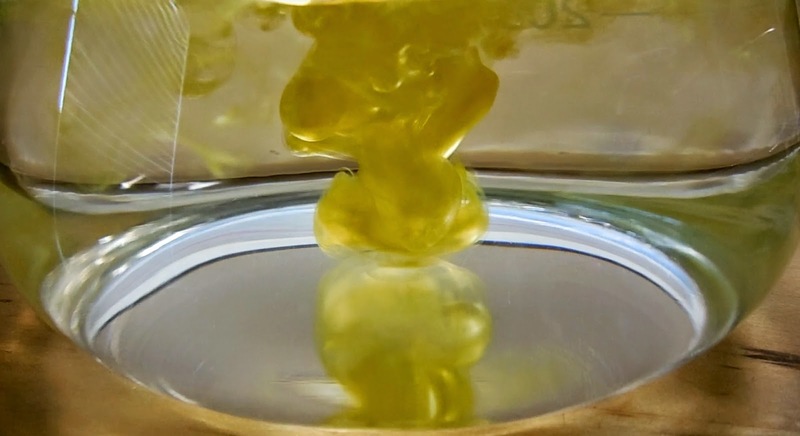 The fact that a bright yellow precipitate is produced from two clear solutions is striking enough, but the real magic of this demonstration is when it is precipitated from a hot solution. I took the flask containing the lead iodide and heated it to near boiling on a hot plate. It took a little while, but eventually all of the yellow crystals dissolved. This returned the solution to being completely water-clear. This happens because lead iodide is almost ten times more soluble in hot solution than in cold. I then turned off the heat and allowed the flask to cool to room temperature on its own. This causes the lead iodide to precipitate back out of solution. 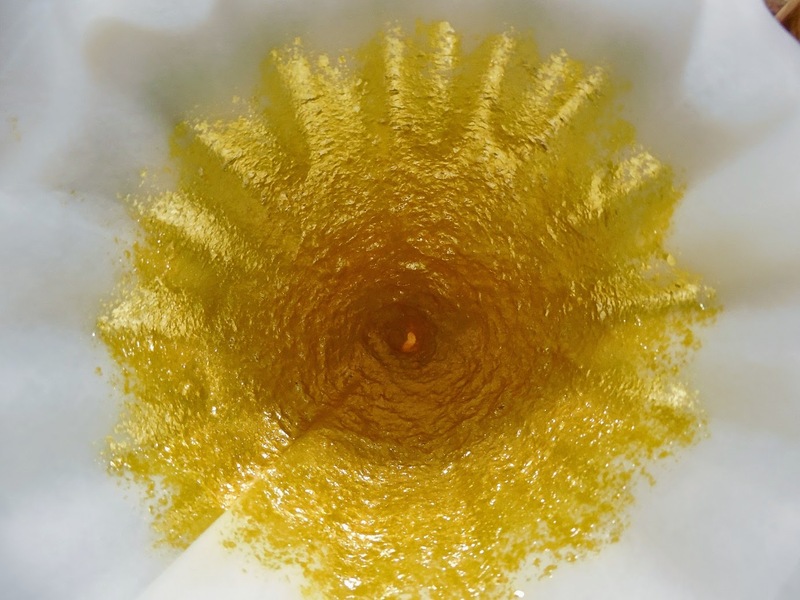 This time, because of the slow cooling, it forms extremely thin hexagonal plate-like crystals that shine and glitter as they move around the solution. It's incredibly beautiful to watch - if you haven't already I highly recommend watching the video to see it. This part starts at 5:37. Here are a couple of the more beautiful photos I captured of it. Again, click the photos for a much larger view. After watching the crystals form and float around for a few hours, I placed the flask in the lab fridge overnight to push as much of the compound out of solution as possible. I then filtered it to isolate the lead iodide. All of the tiny crystals fused together on the filter paper to form a very beautiful sheet of golden iodide. I very carefully collected this and placed it in a vial for display. The final yield was 0.8g PbI2. Finally, cleanup and disposal of the waste solution is an important point. We want to ensure that all of the soluble lead has been eliminated from everything it may have come into contact with. This can be done simply with baking soda (sodium bicarbonate). I made a hot, saturated solution of bicarbonate and added this to the waste solution that the lead iodide was filtered from. This caused the solution to go cloudy with a lead carbonate precipitate. The iodide is still marginally soluble, but the carbonate is truly insoluble. This precipitate can be filtered off and disposed of as regular garbage. The solution now contains only potassium nitrate and baking soda, and can be poured down the drain with plenty of water. Anything that came in contact with the lead-bearing solutions should also be treated with baking soda in the same way. Any beakers, funnels, filter paper, stirring rods, etc. that may have droplets of soluble lead compounds must be cleaned up, You don't want to come back later and touch a tabletop contaminated with these toxic salts. I watched a lot of your youtubes - great stuff! How can i find your email i wish to ask you something. Thanks! If you have a Youtube account, you can send me a message there. It's free and easy to make one if you don't, or you can post questions here. Hi Dan, congrats on a great site and awesome blog. I would be very interested in talking to you about some products/problems tat i am incurring. New challenge for you lol. Would you be interested in having a chat about this opportunity ?? How long does this experiment take exactly? Does it take a long time or can I get it done in an hour? i tried this experiment before and i end up with too much precipitate after mixing the two compounds . what is my mistake ? 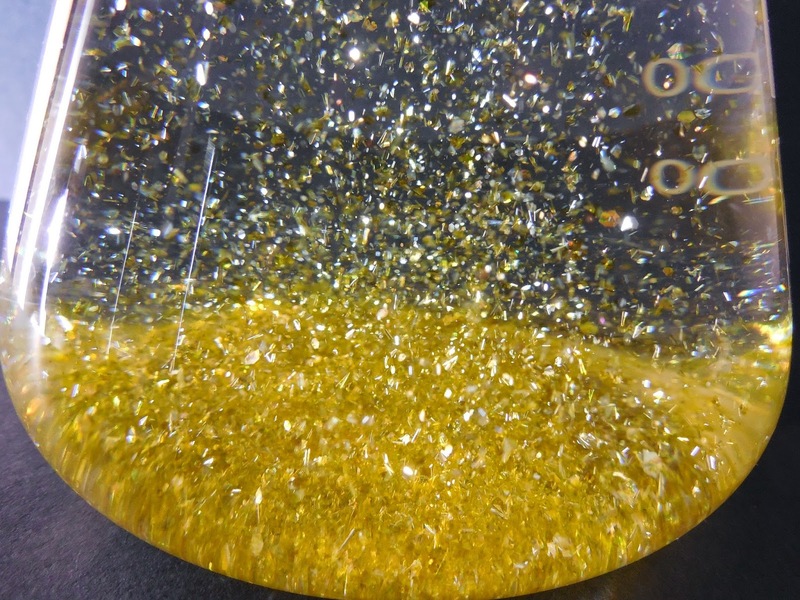 i wondered if golden rain can be enclosed and used like a snow globe, and whether the crystals would last for a long period of time. can you answer this? That should work, yes! The flakes of lead iodide are so thin and fragile, though, I wonder how it would look after shaking it around many times. The compound itself is stable, but the flakes might break up into tiny bits (which might look even better!). A lead iodide snow globe, of course, would be a very dangerous curio to have; if it broke, you'd have a very toxic lead compound spill all over! if you could email me at nclifford@rogers.com i would be most appreciative. HI could you help me out, i have science project due and i am trying to find the theoretical yield of both of the products. i am lost and in need of help. To find theoretical yield, use stoichiometry and follow the chemical formula I gave in the post. I started with 0.8g of lead nitrate (Pb(NO3)2). Divide this by lead nitrate's molecular weight (given in g/mol) to get moles of lead nitrate. Divide by the coefficient in the equation for this compound (1) and multiply by the coefficient for the compound you want, lead iodide (also 1). Multiply by the molecular weight of lead iodide, and you find the theoretical yield in grams. 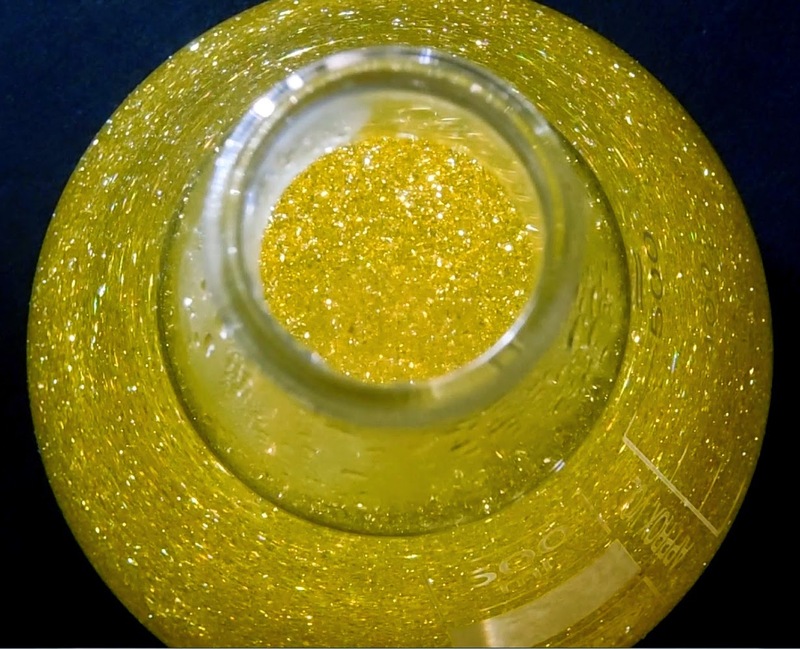 Can you touch the gold glittery crystals before you put them in the vile? or are they toxic too? Sure! It should all dissolve immediately. Thanks for a great posting. After several tries using the boil and cool method which took 1-2 hours, I tried cold water (from the fridge) to initially dissolve the reagents. No lead iodide precipitates on mixing but wait 5 minutes and the golden rain effect begins. Might be easier for classroom demonstrations. Also I substituted Lead Acetate (0.9gm) for the Lead Nitrate in case that matters. What branch of chemistry does this experiment fall under? Does this need to be done in a fume hood or can I do it as a demonstration in my classroom without one? Nope! This reaction produces no gases so you don't need a fume hood. Very careful consideration of safety needs to be done, however. 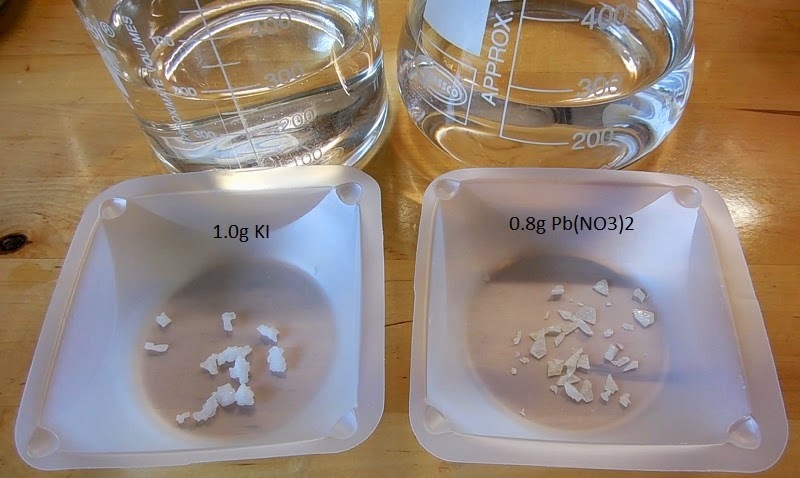 The lead salts used in this experiment are highly toxic and need to be handled carefully, and everything (the remaining liquid and any equipment that touched the solution) has to be neutralized fully before disposal. See the video linked at the top for more info. Good luck, but be very very careful! I bought the potassium iodide from eBay, and made the lead nitrate myself by dissolving lead (also from eBay) in nitric acid (also made myself). Hi i am Mohan, I saw your video of golden rain can you tell me what was the concentration of the liquids you used. which concentration is best to do this experiment? 1) We (me and my friends) performed this practical in our chemistry lab in college but we were not aware of the cleanup and disposal process, so we just simply washed all the apparatus used with water and thrown away the lead nitrate in wash basin. Is it fine or would cause harm later? 2) Adding up to above situation, me and my friend wanted to show this experiment to our parents and so we took the lead iodide solution to our home and started heating the solution in a glass cup which broke due to over-heating and the solution was all over the gas stove and as we were not aware of the safety to be taken we just cleaned it with water. Will it cause harm later? Of course I would properly attribute your work. Wow sorry for the slow reply, I only just saw this! You can certainly use some pictures for your page, with attribution. Thanks for the interest! What objectives would thisnexperiment was fall under?